Inside development of one of Bioshock's most complicated levels. Fort Frolic—BioShock’s lavish setting for Sander Cohen’s Snapchat murder gala—tends to be held up as that game’s standout level. It sits about halfway through the game, and I can’t deny that the anticipation of reaching it is a joyous thing. 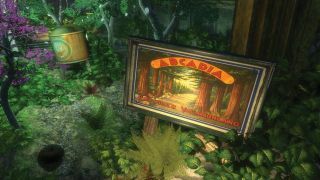 But encountering Fort Frolic would be nowhere near as satisfying without the verdant lead-in of the player’s exploits in the overgrown botanical environment of BioShock’s fifth level, Arcadia. In Arcadia, players must steer luckless lead character, Jack, through Rapture’s principal arboreal leisure and agricultural hub—its lungs ‘n’ larder if you like. But how does the level actually work from a design perspective and how does it augment your trip to the neon murderfest of Fort Frolic? Level designer J.P. LeBreton outlined three key requirements for Arcadia, as laid out by BioShock’s writer and director, Ken Levine: 1) Arcadia is where Ryan kills off all the plants in an attempt to kill you, 2) you’re locked in until you can fix it, 3) there’s a scientist there who helps you restore them. “Aside from the initial brief, I had a lot of freedom to lay out the level and orchestrate as needed,” remembers LeBreton. The world you’ve encountered prior to Arcadia has been one of greeny-blues, shiny brass and, in the case of the preceding fourth level, Smuggler’s Hideout, grey rock. Arcadia is thus able to make an immediate impact on players simply by switching up the colour palette. Vibrant greens predominate, punctuated by the pinks and orangey yellows of water lilies, or pinkypurple tree blossom. LeBreton has previously said the idea was “to truly shock the player with the strange sight of an underwater forest”, but he tells me that this makes it sound more intentional than it was. Initially the shape of the space was influenced by the idea that BioShock would be a spiritual successor to System Shock 2. Over the summer of 2006 the level was rebuilt piece by piece, mostly by the 2K Australia art team, to reorganise the space. One key edit was to tweak the scale of the Tea Garden, for example making the corridors you move down roughly twice as wide. The main addition to the space involved splicing the entire Arcadia Glens central connecting hallway into the existing layout. The idea was “to separate the areas from one another and establish that hierarchical navigation-type idea”. With numerous nooks, crawlspaces and subareas radiating out from Arcadia Glens, there are a lot of doors occupying a tight space, including some you won’t be able to open until later in the level. That can be a confusing experience for the player. “Whatever confusion the layout we shipped caused, the earlier versions of it would have been even more confusing, I think,” notes LeBreton. He also points out that although having so many identical doors can induce a kind of choice paralysis in the player, they also offered a technical benefit. To go back to Ken Levine’s requirements for Arcadia, this section of BioShock would need to trap the player while they fixed a problem (the problem here being uberjerk Andrew Ryan attempting to poison all the plants and suffocate your character via toxic gas). But it was the plant die-off caused by gas which presented the biggest technical challenge in Arcadia. The solution was “a totally opportunistic use of existing tech”, says LeBreton. Scripting, in this instance, could mean a fight between Splicers which the player would stumble upon, Splicers lying in wait for players, or even fights staged near a Big Daddy to amp up tension for players as they tried to avoid angering it. But it was the plant die-off caused by gas which presented the biggest technical challenge in Arcadia. The solution was “a totally opportunistic use of existing tech”, says LeBreton. “The original design for Bioshock included a ‘pressure’ system, where you could change the pressure in zones and it would alter the gameplay, making certain enemies and weapons more or less effective. The regrowth effect you see once you’ve released the Lazarus Vector into the atmosphere was mostly the work of 2K Boston’s FX artist Stephen Alexander. Alexander painted a custom mask that would appear to change as an index value moved from 0 to 1. “It’s probably a common FX/shader trick now but it was the first time I’d seen it in 2006/7,” says LeBreton. This same technique by Alexander is also used to create the effect of botanist Julie Langford writing a safe code with her finger on a fogged up window. The dying off of the vegetation in Arcadia reveals the mysterious symbolic daubs of the Saturnine cult etched on the walls and a few formerly unreachable cave areas where these heavily spliced-up cult members meet. “The Saturnine were a fairly late addition, and their main value was to enrich the area’s backstory,” LeBreton previously explained. The idea was that these were a group of frat boys or businessmen who had gone feral, cribbing pagan imagery from pop culture and taking weird Plasmids. Accompanying this new variant of foe is a new type of weapon; the Chemical Thrower. “Most games with a certain number of weapons and abilities plan out the introductions of each new tool with a schedule or ‘power ramp’ as it’s sometimes called,” explains LeBreton. “For Arcadia we knew we wanted to introduce the crafting system, the one or two remaining new Plasmids and, originally, a weapon called the BioWeapon. The level’s intense finale sees the player fight off the Splicer hordes while the Lazarus Vector revives Rapture’s plant life and oxygen supply. The ambush actually shares a scripting system with events in two other BioShock levels; Medical Pavilion and Fort Frolic. Once the system had been fine-tuned and was working well in Arcadia, LeBreton turned it into a ‘prefab’ (“not unlike the modern Unity engine concept of prefabs”). This meant that fellow designers Paul Hellquist and Jordan Thomas could utilise it in their own BioShock levels (Medical Pavilion and Fort Frolic respectively) and just tweak a few settings to ensure it matched the levels’ position on the game’s difficulty curve. Given Arcadia came so early in LeBreton’s career, I ask what he would do differently if he was designing the same space today, with a decade of experience behind him.